Text-based interfaces that can interact with users on their preferred digital platforms can be transformational for enterprises. Chatbots can efficiently drive customer conversations, and offer an intuitive brand experience that is available round-the-clock. An enterprise chatbot also drives efficiency and productivity in diverse enterprise operations and business processes. 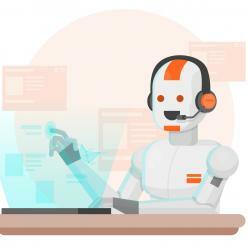 From the simple informational ones that answer customer queries, to complex predictive ones that leverage natural language processing, enterprises are turning to chatbot development for diverse business use cases. Ready to optimize operations with chatbots? Have a conversation with our experts on how our chatbot development teams can help. Fill the form below! Design, build, and scale chatbots that serve your specific business needs.